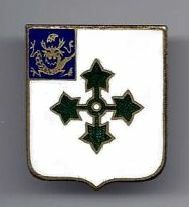 The 47th Infantry Regiment was activated on June 1st, 1917, at Camp Syracuse in New York. On May 25th, 1918, the 47th Infantry Regiment landed at Brest in France during World War I. Two months were spent training with British and French units before July 27th, when “the Raiders” (their nickname) were marching knee deep in mud to their first action. Cracking the German line by fighting Indian style, the 47th Regiment soon took possession of the town of Sergy. The 47th Regiment then joined with other units of the American Expeditionary Force to deal decisive defeats to the Germans at St. Mihiel and the immortal Meuse-Argonne, thus breaking the German war machine and ending the hostilities. By December the 47th Regiment had moved to the Rhine and remained there until the fall of 1919 when it sailed home. On September 21st, 1921, the Regiment was deactivated after earning five battle streamers for action during World War I. The 47th Infantry Regiment was reactivated again on August 1st, 1940 at Fort Bragg, North Carolina. In early November, 1942, in the campaign to secure the northern coast of Africa, the 47th Regimental Combat Team stormed the beaches of Safi, Morocco. The 47th continued across North Africa with the Allies in their successful campaign to drive the German armies from that continent. Landing at Palermo, Sicily on August 1st, 1943, the Raiders swung into action one week later. On August 26th, Sicily was officially declared in the hands of the Allies. On D-Day plus 4, June 10th, 1944, the 47th Infantry Regiment landed on Utah Beach in Normandy, France. By June 14th, 1944, combat patrols were in contact with the Germans and by nightfall of the 16th the 47th Regiment blocked the last escape route for the Germans in the Cotentin Peninsula. The famous port of Cherbourg was next and its capture is one of the brightest chapters in the 9th Infantry Division’s history. With the help of sister regiments the 47th Regiment laid siege to the city. Stubborn opposition greeted the Raiders, for the enemy held the high ground and other strategic positions. However, just after noon on June 25th, 1944, 2nd Battalion of the 47th Regiment became the first Allied troops to enter the city. Stiff resistance was encountered until the 28th of June, the day that Cherbourg fell. The 2nd and 3rd Battalions received Distinguished Unit Citations for their gallantry and heroism in the seizure of the city. For a few days the 9th Infantry Division’s operations halted for necessary rest and re-supply. The order to resume combat came on July 9th and soon elements of the 47th were in the midst of the “Battle of the Hedgerows”, one of the bloodiest battles and toughest encounters of the French campaign. With the breakthrough at St. Lo the rush was on. Innumerable Allied units raced across France in pursuit of the retreating Germans. By August 1944, the 47th had forded the Seine River and headed for the Vesles and a memorable anniversary. It was in August 1918 that the 47th Regiment battled over the Vesles in a bloody crossing. Twenty-six years later the regiment crossed the river unopposed at the same point. In crossing they passed a monument erected to commemorate their heroic efforts in World War I.
Belgium was next for the 47th and they gained another first – this time they were the first Allied troops to set foot on Belgium soil in the drive for Germany. Then the long awaited invasion of Germany began. On September 14th, 1944, the Raiders breached the mighty Siegfried Line. Three days later the 47th became the first Allied unit to pierce the Siegfried Line. Following the Battle of the Hurtgen Forest, the Regiment was directed to shift north and drive to the small town of Frenz, where they fought to capture the Frenzerburg Castle. Despite staggering U.S. losses, the town and castle fell. The 1st Battalion and Medical Detachment received the Distinguished Unit Citation for their action in the battle which punctuated 145 continuous days of combat for the Raiders. The German counter-offensive known as the “Battle of the Bulge” in December 1944 hit the 47th Regiment full force, but it repulsed the attacks and soon ripped open the way to the center of Germany. The famous Rhine River was now in sight and one of the most glorious chapters in the history of the U.S. Army was about to take place at the Ludendorff Bridge near the town of Remagen. This key span marked the spot where the first Infantry Regiment since the Napoleonic Wars battled across the Rhine. The 47th Regiment was forced to earn this distinction by engaging in some of the most savage warfare of World War II. The Germans showered the Ludendorff Bridge with shrapnel and shells. Through this wall of death, the 47th pushed forward and in March 1945 it established a bridgehead and held it against all attempts to dislodge them. Finally, in the last week of April 1945, elements of the 47th Infantry Regiment and the 337th Russian Rifle Regiment joined ranks. The once mighty Third Reich had been defeated and among its conquerors stood the Raiders of the 47th Infantry Regiment!